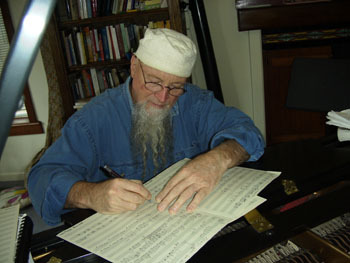 Composition in Blue: Unlike the Beatles, Terry Riley knows how to read those squiggly bits. Former Aptos resident and composer Lou Harrison once remarked on an interesting geographical reality in reference to his musical influences. "In New York, you're just stone's throw away from Europe, whereas here [in California] you're that much closer to Asia." Like other West Coast composers, Harrison was entranced by musical sounds he heard in Asian immigrant communities and early field recordings. He wasn't alone. Henry Cowell, LaMonte Young and Terry Riley all looked east to augment their compositional voices. On May 3, the Pacific Rim Music Festival plays host to the 70th birthday of one such musical traveler: Terry Riley. Joined by the Kronos Quartet and Zakir Hussain, PRMF's Riley birthday concert will be, in the words of Kronos founder and first violinist David Harrington, "a very warm occasion." The concert features a new work, The Cusp of Magic, which draws inspiration from a number of sources, including astrology and Chinese traditional music. "The title," says Riley, "refers to the astrological cusp between Gemini and Cancer, which is the place in the Zodiac where I was born." In addition to celestial inspiration, The Cusp of Magic also brings to the stage Chinese Pipa virtuoso Wu Man, who Harrington refers to her as "the Heifetz of plucked instruments. Her instrument has so much color and so many timbral possibilities." The Cusp of Magic is one in a long series of collaborations between Kronos and Riley. Hired by Mills College in the late '70s, Riley faced only one annoyance in his daily walks through the campus--a lanky bespectacled youth who "kept pestering me for scores." That ambitious youth was none other than Harrington, whose group had just landed a residency at the college. While most composers would immediately leap at the prospect of composing for this young, talented and energetic outfit, Riley demurred. For most of the '70s, he'd been studying Indian vocal music and hadn't written a note in years. Perhaps tired of the greater musical world's reception of his innovations and fed up with the lack of effort most people put into performing new music, Riley had come to rely upon himself to get his music performed. Kronos wanted to alter that pattern. UCSC assistant professor John Sackett, then a graduate student at Mills, remembers Kronos' early collaborations with Riley. "They went so far as to spend weeks at a time up at Terry's house in the Tahoe forest getting the sounds that Terry wanted. Without Kronos and their commitment, Terry probably wouldn't have jumped back into the notated world." Riley's birthday celebration is but one of nine offerings in PRMF's 2005 season, which opens Friday, April 29, at 5pm with a collaboration between Indonesian and Korean percussion ensembles. The festival runs through May 7; see http://pacificrim.ucsc.edu or call 831.459.2159 for festival details. Riley's Fantastic Birthday Celebration. Works by Terry Riley, John Adams, La Monte Young, Pauline Oliveros-Guest, Tuesday, May 3, at 7:30pm at Santa Cruz Civic Auditorium, 307 Church St.; 831.420.5260.